A business without a website in today’s interconnected world has little to no chance of survival or growth. Most customers, potential and existing, would expect some form of online presence of most business these days. Whether it is to find out store hours, contact information, or more detailed information such as services offered and products carrier, a website is a must have tool for new and established businesses alike. Thanks to content management systems such as WordPress, setting up and building a website has never been easier. 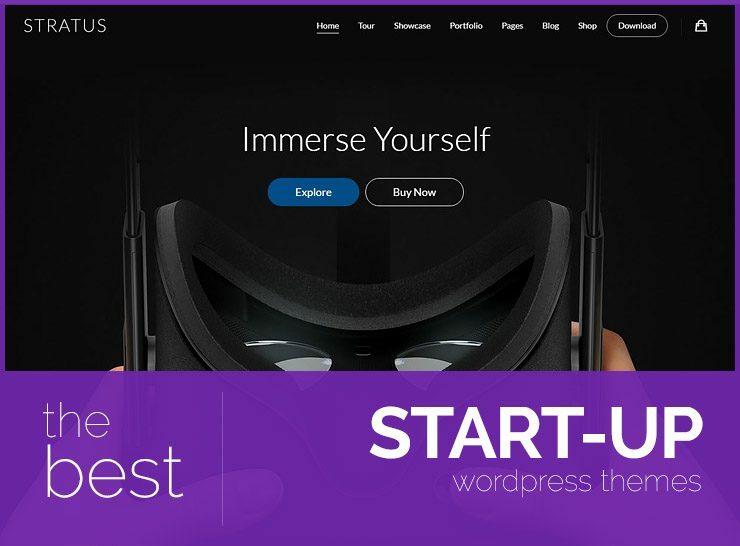 There are many small business WordPress themes that are professionally designed and fully loaded with amazing features and can help you create a striking and engaging website for your company. All these small business themes require a self-hosted WordPress site. 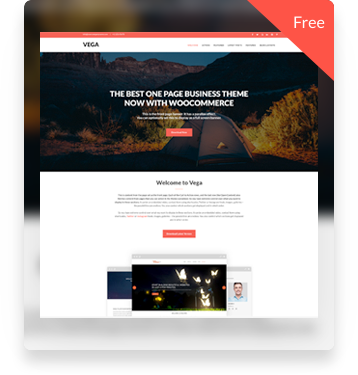 Vega Pro is a versatile, light weight, yet fully loaded small business WordPress theme that boasts a number of high quality and very useful features that will help you build an amazing website for your business. One of the most striking features of this theme is its video and image slider, where you can set up images and videos to display in a carousel on the home page and select the animation effects for each of the slide caption elements separately. So you can have the slide heading appear from the top, the description zoom in, and the link button bounce in from the left – and all of this can be tweaked and set up from the theme Customizer screen. The theme can also be used to set up a single page home page, where multiple rows of content can be set up using the friendly and easy to use Customize screen and linked to from the main navigation. The sections you can use are two call to action rows, featured pages with icons and with images, latest posts, testimonials carousel, partner logos, team members, and an open content section which can show virtually anything. Any sections that you do not want to use can be hidden and the order of the sections can be modified to suit your needs. The theme also comes with 4 different blog layouts, 2 footer rows, image and text logo options, sidebar widgets, and multiple page header options. 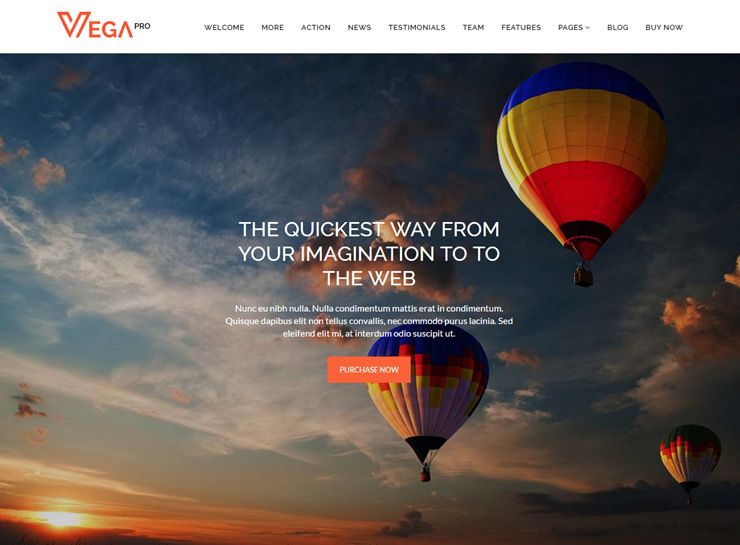 Vega Pro is extremely easy to setup and customize, and will help you get your website up and running in minutes thus making it a solid choice for your business website. Main features of Vega Pro are: image and video slider, multiple header image options, 2 call to action rows, testimonials carousel, open content on home page, team section, featured pages with images, featured pages with icons, animated content, full width template, parallax backgrounds, one page home page. 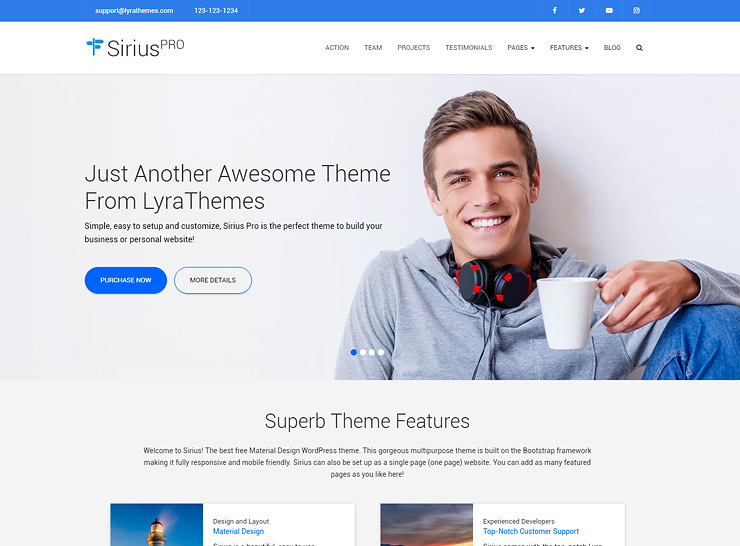 Sirius Pro is a unique and beautifully designed WordPress theme ideally designed for corporate websites and small business websites. 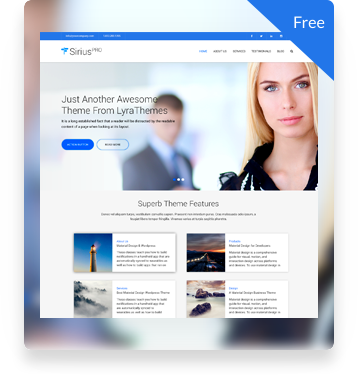 Sirius Pro is a business theme packed with tons of features and is crafted keeping in mind the need for flexibility and a professional outlook to the site. One of the key features of Sirius Pro includes the ability to display projects and portfolios in different and unique ways across the website. This small business theme works with shortcodes giving flexibility to insert cards with stylish and beautiful looking content, including both icons and images. This small business WordPress theme focuses on aesthetics and builds upon several elements of a business website including team, FAQs, social media links, call to action areas, and testimonials. These can be displayed beautifully through shortcodes across the site. The theme is also designed to function as a single page site, so all of these elements work great on the homepage as well. Sirius Pro provides great flexibility in creating the homepage with drag and drop sections. This allows the user to craft homepage with only the options they want to display like testimonials, call to action, and a portfolio showcase. Other elements from Sirius Pro include multiple pre designed options for homepage as well as blog feed. Main features of Sirius Pro are: Background color options for homepage sections, parallax backgrounds for call to action sections, slider for the homepage, unlimited fonts and color choices, cards based display option for services and team, different post formats including videos. 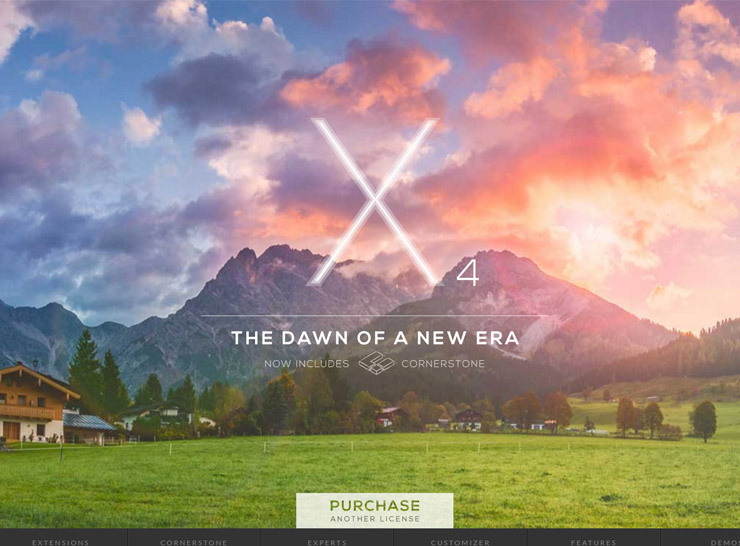 X is one of the most popular WordPress themes on the market today. It is a powerhouse of features and self contained capabilities. X comes with a multitude of plugins that it integrates with, such as UberMenu, The Grid, ConvertPlug, Typekit Integration, Layer Slider, Essential Grid, Cornerstone, Envira Gallery, Content Dock, and many more. It also works flawlessly with Video Lock, MailChimp, Disqus, Facebook Comments, Analytics Integration, Revolution Slider, and Visual Composer. X’s value lies in its plugin ecosystem, that are all included with your purchase and the theme itself integrates perfectly with each of them. The theme has 4 completely unique designs built into it that the folks at theme.co call stacks. Starting off with one of these designs, given the plethora of options and extensions included, X ends up helping you create a completely unique, one of a kind website with little to no coding knowledge needed. 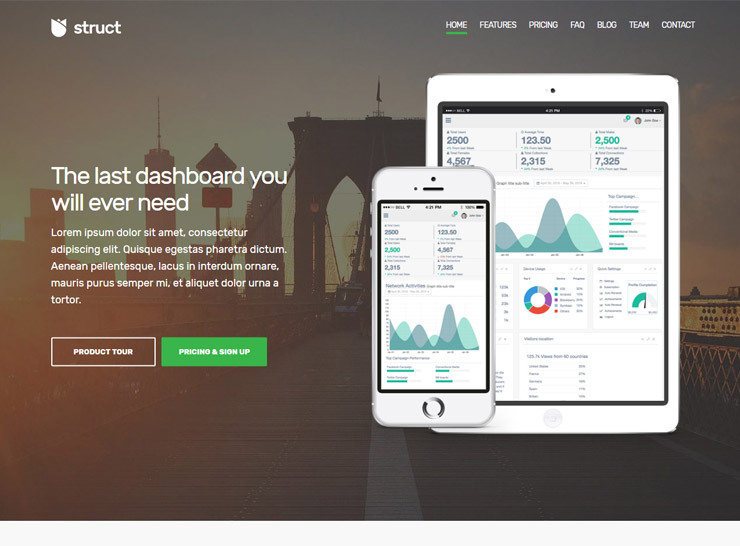 X customers can chose between Cornerstone, an incredible 100% front-end page builder or Visual Composer for use within X.
Struct is one of the latest themes by CSSIgniter. It comes with a simple yet effective design that is suitable for most small businesses and startups. The drag and drop home page editing allows you to build the website’s front page exactly the way you want it by manipulating flexible content widgets. Struct comes with 13 custom widgets, including contact maps, scheduling, social networks and more. Create services, projects, team members, FAQ, clients, testimonials, and slideshows right out of the box. These options are included as custom content types so they are easy to manage and update, without the need of extra plugins and code. The color scheme can be changed to match your brand as every color in the design is dynamic and can be changed using the Theme Customizer. 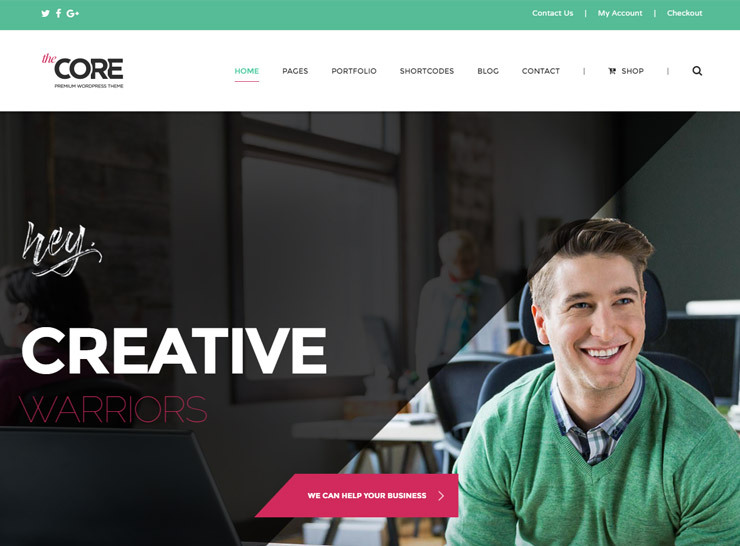 The Core is a stunning, polished and professional small business WordPress theme that can be used in a variety of ways thanks to the 16 pre-built designs that it comes bundled with. Whether you’re looking to build a corporate website, or a medical related website, The Core has you covered with the different design options. All the designs are hand crafted specifically for their respective industries, guaranteeing that everything within their structure was well thought out. The Core’s Main design is a highly unique design, with a modern design and amazing imagery. 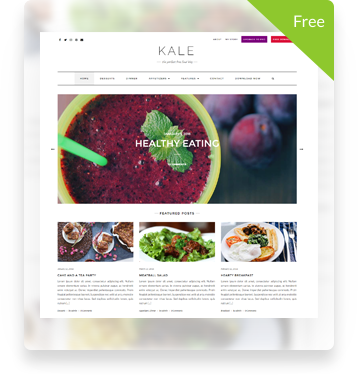 Extremely clean and sophisticated, carefully developed and professionally designed, The Core is packed to the brim with an great set of page templates, tools and features that empower you to setup an amazing website in minutes. Using the theme’s evolved shortcodes together with the drag and drop page builder helps webmasters create unique, complex pages that satisfy their brand’s needs without writing a single line of code. Startuply will help you launch your startup or new business without any headaches. Whether you’re building a coming soon page or have a selection of products and services ready to sell, this complete turn key WordPress theme has you covered. 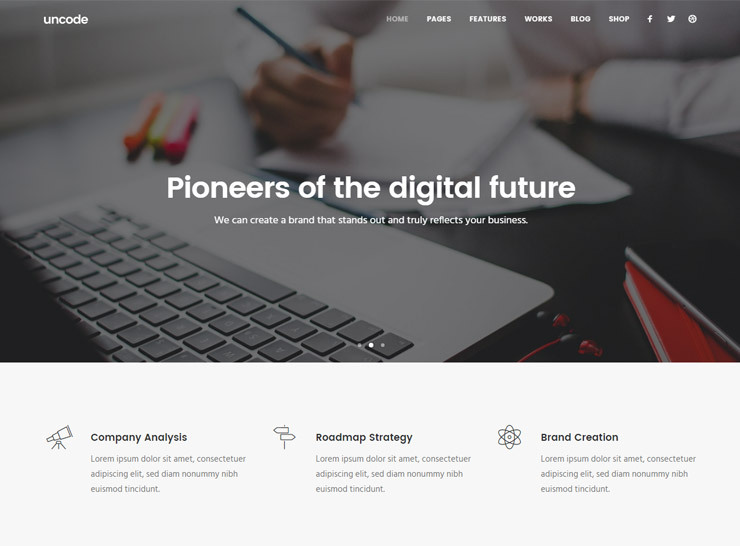 Startuply is a powerful, multi-purpose theme that can be used by established business or startup projects, as well as product or event launch websites. The landing pages that can be created with this theme are truly unique and stunning, with a well thought out layout and many possibilities for the webmaster to customize and make the experience a unique one. 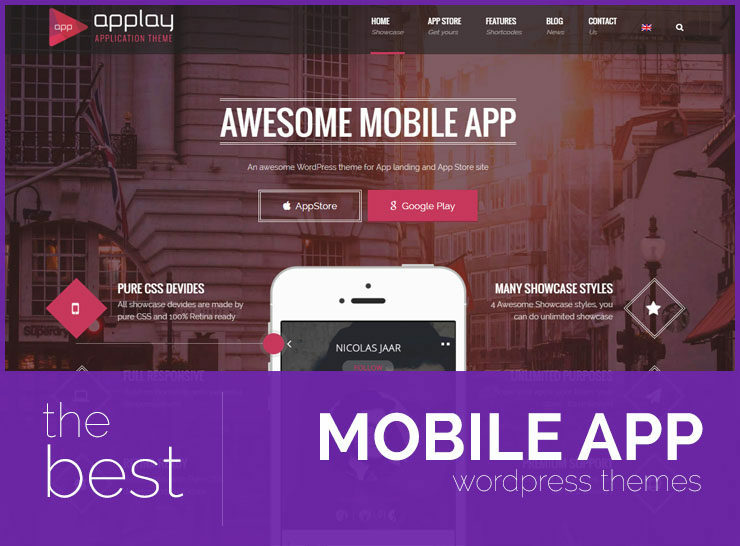 The theme comes with 7 pre built layouts such as home page with details of an app, home page without any animation, a fast sign up home page, a waiting list home page, home page with a video background, and a standard page integrated with Revolution Slider. These varied options suit most new business purposes, whether you want to start off with a full fledged website or a signup form to collected email addresses of interested parties. 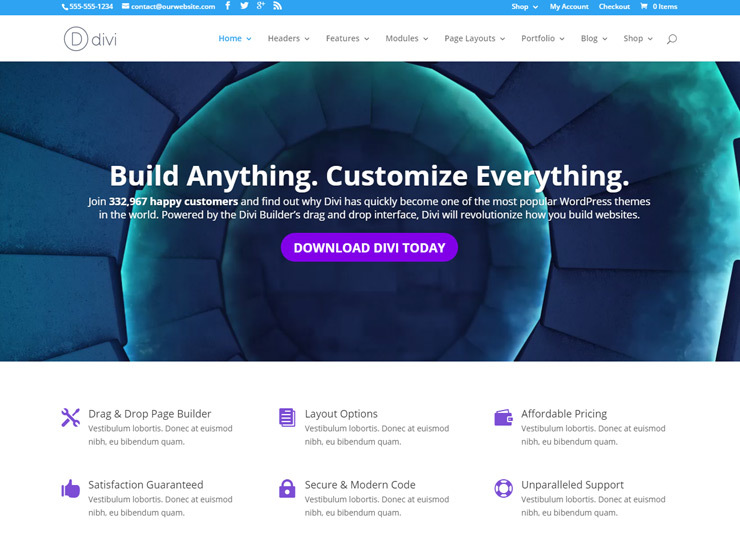 With 400,000 customers and counting, Divi is one of the most popular WordPress themes on the market today. 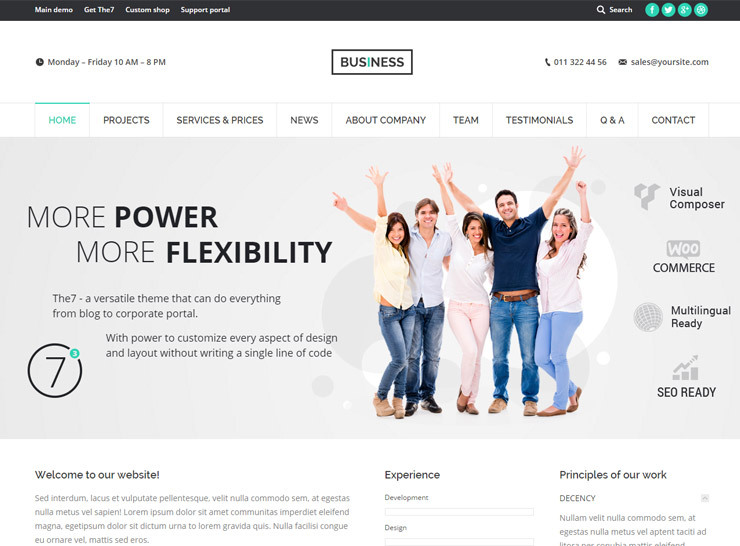 It is an ideal small business WordPress theme boasting beautiful design elements, suitable for both experienced and novice WordPress users alike. It brings flexibility in design with its popular visual design builder that has the option to display real time changes on the frontend. 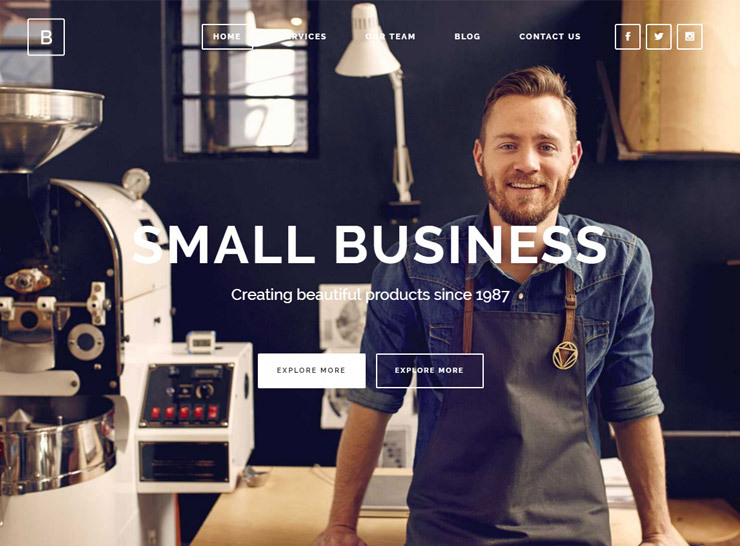 As a small business theme, Divi brings tons of options for the user to choose from. These options include choosing elements for each page, using drag and drop options to modify their placement, checking these changes for responsiveness and inline editing as well. Divi also has features that allow for split testing to see which design options work best for your audience. Its most popular features include the powerful elements that can be dragged and dropped on any page. It also comes packaged with 20+ pre designed layout options to choose from. Main Features of Divi are: 40+ content elements such as blurbs, testimonials, call to action, contact forms, 20+ design options for pages, options to save layouts for future use, responsive editing, and flexible header and footer options. Whether you’re a restaurant or a creative agency, a startup or a services company, Avada has a solution for businesses and websites of all kinds. Simply select the design of your choice as a starting point and begin building your website without having to go through code. 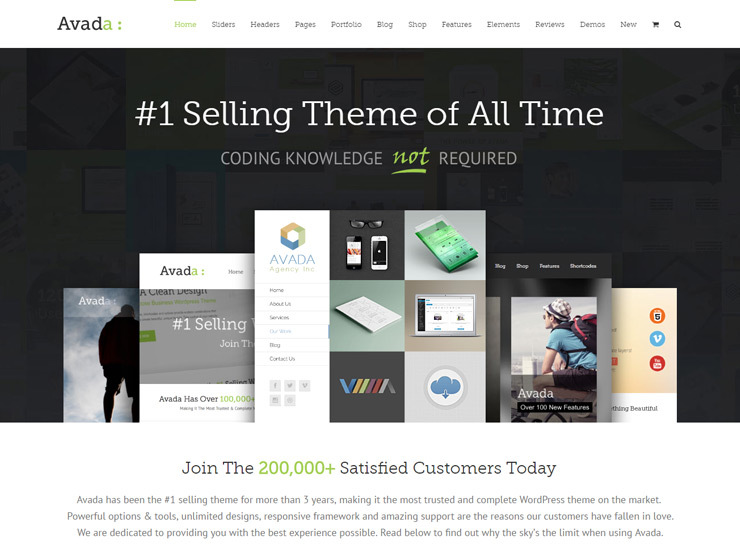 One of the most famous WordPress themes on the market today, Avada comes with several great tools such as Fusion Theme Options, Fusion Page Options and Fusion Builder. With these plugins, several features open up to modify pages, drag and drop elements, and design the website quickly and efficiently. The theme is also compatible with the popular eCommerce plugin, WooCommerce, giving the flexibility to design a storefront as well. With the shortcode generator, Avada allows you to use different elements across several pages on the website. 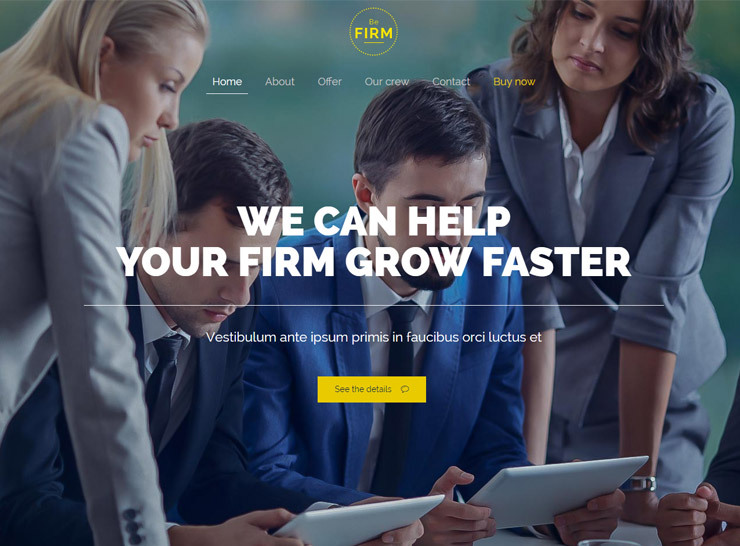 It also comes with Fusion Slider and MegaMenu making this theme super flexible, easy to use, and a great option to quickly set up a beautiful and functional website for your business. In today’s interconnected world even small businesses can take on the global market. An online presence is a one stop for customers to get information and get engaged with the products and services a business has to offer. With this goal in mind a website has to be straightforward, uncluttered with features that capture the attention of the audience. 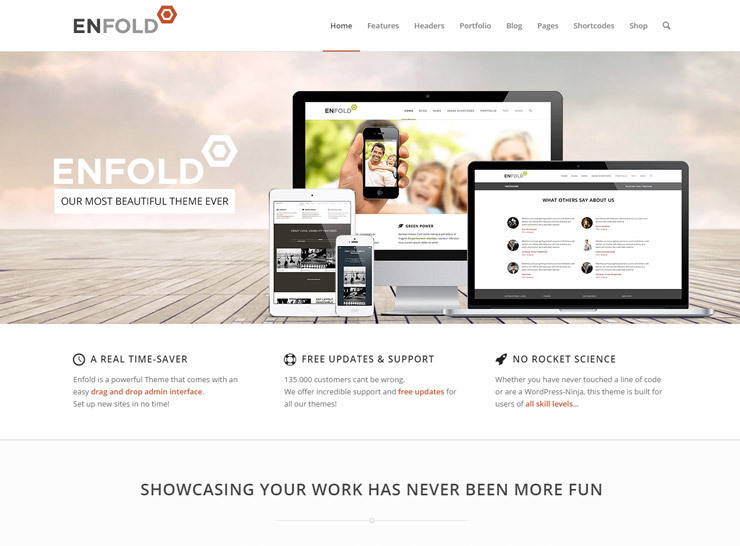 Enfold understands the needs of a business themed website. It is packed with portfolio layout designs that can complement any business. Putting it up is no rocket science either, simply drag and drop content into place. It offers color schemes and a myriad of user-friendly features to create a beautiful website fit for the theme of your business. Business on a grander scale is made possible through the digital world. In fact, an online presence is a necessity especially for a small business to make a mark in their target audience. A well designed website is imperative since it is used to advertise and communicate to the market products and services offered. Like a real store a website should be clean and crisp emphasizing salient points. BeTheme understands that you need to communicate with customers through moving pictures and fresh layouts. Be Theme is powerful enough to meet your expectations. It has 250 plus pre-built websites with super easy one click installation. User-friendly and extremely fast Be Theme builds the website for you just the way you want it. A business needs a strong presence. This is especially true for a small business. Small businesses need to reach out to more customers within a limited resource. In the internet where nearly everyone can access, this is possible. Customers are in sync with their digital devices and check information round the clock. To capture an audience, a business website must clearly communicate its products and services through crisp pictures and slick layouts. Uncode caters precisely to these needs. 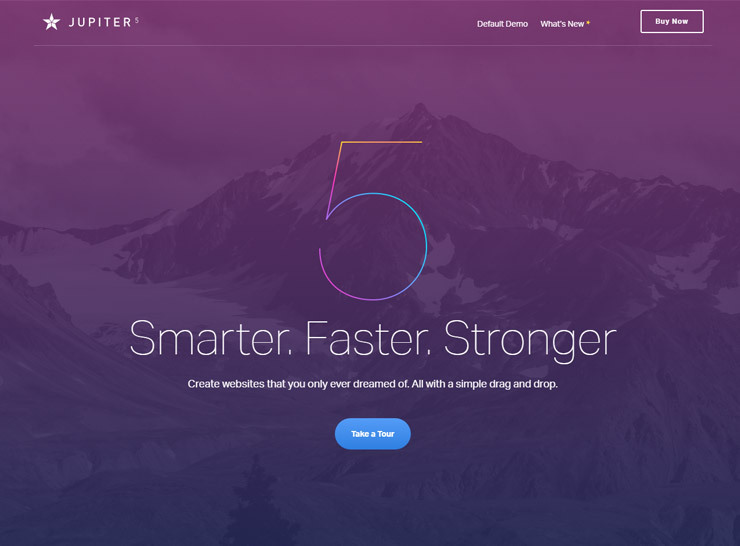 It features a creative web builder which includes tailored visual composer for fast and easy webpage building, revolution slider and layer slider. Uncode fulfills all the needs of your business enterprise. Exhibit your products and services through superb layouts. Engage your audience with an Uncode themed website now. Today an online presence is demanded of any business. In an information-driven world people debunk mysteries and want facts handed out to them. Exhibiting your product and service portfolio online makes sure that you are being transparent and communicating with your target market. A well designed website is imperative for any business with these aims. Professional, classic or hip your design goals will come true with Salient. Salient helps you realize and transform your business language into relatable media that can capture audience’s attention. Features include 150 templates you can mix and match to fit your design preferences. Choose from 500 plus shortcodes to increase website functionality. With the array of choices in Salient you can easily hit your design objectives. Exhibit your business in a beautiful website and gain customers. 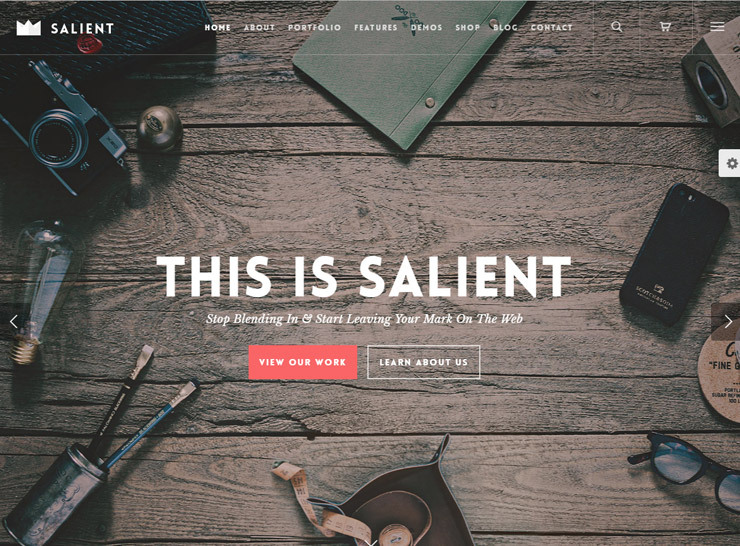 Use Salient today. Small businesses need to have visibility on the internet. In the vastly interconnected digital world this is possible; a market can be reached at any point. For a strong presence, a robustly designed website is essential to communicate products and services. Whether you opt to come across as professional, classic or hip to your audiences a powerful intuitive WordPress theme is your tool. The7 delivers features apt for any business themed website. It includes one click to install plug-in and templates that helps you build your website within minutes. The 7 is the most customizable theme in the market. With a plethora of colors and layouts to choose from you can achieve any style you want. The 7 displays your products and services against the backdrop of an engaging design. Gain customers and impart relevant information about your business. The 7 theme makes all of these happen.